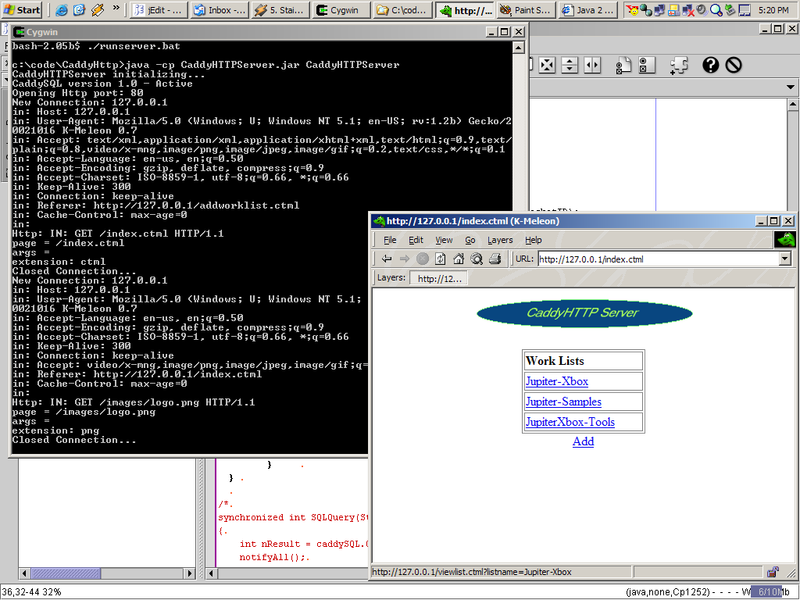 CaddyHTTP is a small HTTP server written in 100% Java. I originally wrote this so that I could integrate it into several other connectivity projects I work on from time to time for fun. CaddyHTTP is not meant for heavy stress servers. It is designed for small applications where you might have a small group of co-workers connecting to the system at once. The root page that gets loaded by CaddyHTTP is "index.ctml". this is hard coded currently. This is simple a personal project. It is not meant to compete with other HTTP servers. I created it because I thought it would be a fun project. (and it has been) I started the project back in February 2003. I put it on the back burner for a while. I may or may not ever modify the code again. CaddyHTTP is released under the GPL open source license. I released version 1.0 of CaddyHTTP back on May 30th, 2003. There has been no activity since. All info is available in the readme.txt. Simply run the "runserver.bat" batch file. You MUST have Sun's Java runtime or SDK. Either the JRE or SDK will work. You MUST have the Java SDK installed to compile CaddyHTTP. You will need to modify the src/build.bat batch file to set the proper path to your installation of the Java SDK. Once that is done, you only need to run the "build.bat" batch file.